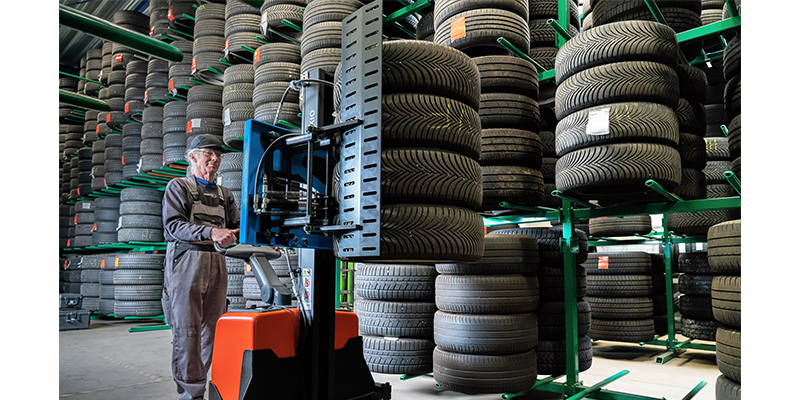 AME International, a provider of tire service tools and equipment based out of Florida, has launched its new tire handling attachment, the Easy Stacker 800. Designed to affix onto an existing forklift, the Easy Stacker 800 was developed for safe and efficient tire handing. The company says the attachment is ideal for tire dealers, retreaders and workshops with limited space. The Easy Stacker 800 easily stacks and transports up to four tires with or without rims, has a lifting capacity of over 350 pounds and will accommodate tire sizes ranging from 16-31-in. in diameter. The device features customizable clamping arms that securely hold tires during transport, allowing stacker operator to optimize stocking facilities. The compact design of the Easy Stacker 800 enables precision maneuverability while reducing manual and hazardous workplace operations.